Avari, Burjor. India: The ancient past. A history of the Indian sub-continent from c. 7000 BC to AD 1200. Routledge. 2007. ISBN 0415356164. Banerjee, Gauranga Nath. 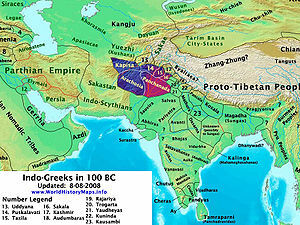 Hellenism in ancient India. Delhi: Munshi Ram Manohar Lal. 1961. OCLC 1837954 ISBN 0-8364-2910-9.